1 double bedroom with a double bed. 1 smaller bedroom with bunk beds (sleeps 2). Brand new fully fitted kitchen with all the usual amenities including fan assisted oven, hob, fridge/freezer, toaster, kettle, microwave. 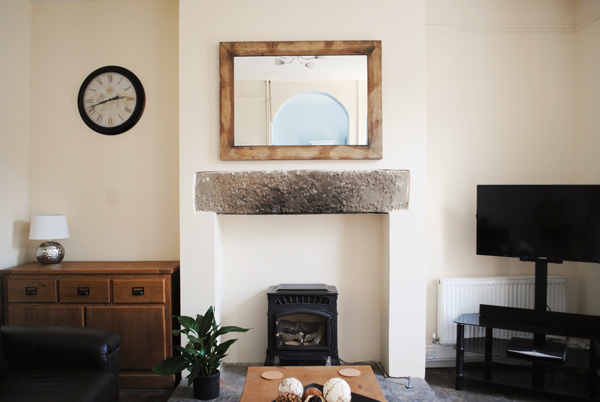 The living room has a beautiful original Yorkshire-stone-flagged floor and there’s a 40 inch HD TV with Sky which includes full Sky Movies package. We also like to provide a few basics to make your stay that bit easier such as loo roll, tea, coffee, milk, olive oil, washing up liquid etc, and if there’s anything you’d specifically like us to get for you, just give us a shout, we want to make your stay as great as possible.